By John 36 Comments - The content of this website often contains affiliate links and I may be compensated if you buy through those links (at no cost to you!). Learn more about how we make money. Last edited November 19, 2017 . Sitting in the office at a car dealer, a mixture of emotions passing through your mind. You love that new car you just test drove; it’s the perfect color, it looks great, it smells wonderful, the reviews are terrific, you can afford the monthly payment advertised in the paper, and you deserve it, right? But then the doubts creep in. Am I spending too much? Should I visit a few more dealers and compare prices? Is this sales rep trying to cheat me? 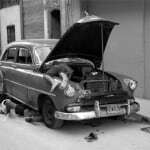 Could I keep my old car and fix it up? How about that used Honda Civic that the magazines say is my best bet? Then the sales rep brings out a stack of papers to sign and starts selling alarm systems, automatic starters for the cold winter mornings, and extended warranties — and you haven’t even made it to the finance guy to talk about how to pay for the car. Do you get up from that chair and tell the sales person, “I have to think about it”? Do you hear your father’s voice saying, “You don’t need a new car; save your money”? So, how can you be sure you aren’t unknowingly fueling a financial disaster? The following are four often over-looked signs to look out for. Spend less than you make, and either put the difference into assets that grow, or sink your money into reducing debt. You want to be poor? Spend more than you make, buy assets that decrease over time, and increase your debt. A car is an asset that declines in value over time. If you buy a new car, the value could decrease 20-40% over the first few years. A $40,000 new car could lose $8,000 to $16,000 in a short time. How would you feel if you lost that much money gambling? Not too good I would guess. I’m sure most people have either experienced or heard about someone who has a home where the mortgage is more than the house is worth (upside-down mortgage). But how many people have looked at their autos to see that they may be in this same situation? Let’s say you buy a new car for $40,000 and you don’t have the money for a down payment or don’t want to put anything down. When you add in sales tax, dealer prep, and license fees, you could be financing $45,000. How about buying a used car for $12,500? Well, it’s used, so you already have much of the depreciation taken, and your taxes and fees will be about $1,500. So you’re only out the $1,500 if you had to turn around and sell it, compared to being out $7,000 if you had to sell the new car. That is a huge difference. So what is the right amount to pay for a car? Many personal finance people recommend using 50% of your gross annual pay to determine the purchase price of a car. If you make $50,000 per year (before taxes, insurance, etc. ), buy a car for $25,000. Do you want to be even more aggressive? Reduce the cost to 25% of your gross annual pay. None of this may apply to you if you need your vehicle to travel a lot with outside sales or you need a truck for your business. Both of these examples show a need for a vehicle that you can depend on for your job. Try to go for the least amount of cost that will bring you what you need to do your job. I’m sure most of you would know without reading any further that buying a used car makes more financial sense than buying a new one, right? But can you put any numbers to it? Let’s assume you put away $2,400 per year by being frugal and buying a used car, and you continue to do so for the forty years you work. That would equate to saving $96,000 — not too shabby. But, assume instead that you take that $2,400 savings and invest it at 8% over 40 years. How much is that worth? Try about $700,000! Some people worry that buying a used car will mean more repairs and that the costs will be more than if they just bought new, but as you can see from the calculation, their worry is unwarranted. Cars now can go 100,000 – 200,000 miles with proper maintenance. If those miles came from driving on the highway as opposed to stop-and-go driving, so much the better. Look for vehicles that are one to 10 years old, with three to five being the sweet spot. If the vehicle is older, find one owned by someone who is meticulous with the maintenance and has already had the high-dollar items such as timing belts and catalytic converters replaced. Sound mechanicals trump looks. You may not love the color or the dings in the door, but if it runs well, live with it. When I was younger, car loans were three to four years long on average. Now, car loans can be obtained for six or seven years. While you may be tempted to lower your monthly payment by grabbing that longer-term loan, look at what that does to you financially. A $25,000 loan at 5% (current auto loan rates as of this writing) over three years gives you a monthly payment of $749, and you would pay $1,974 in interest over the life of the loan. Stretching the loan to seven years would reduce the monthly payment to $353. This is a strategy used by many car sales reps to lure people into buying cars they can’t afford by showing them a low monthly payment. However, the interest cost over the life of the loan swells to $4,681, or about 19% of the original loan amount. Wouldn’t you rather have the extra $2,707? What if you can’t afford the monthly payment of $749 per month? See the previous discussion on overspending. If you purchased a car for $12,500 instead of $25,000, your monthly payment would be $375 per month. An often overlooked cost of buying a car is sales tax. Now, this will vary by state or local rates, but the lesson learned is the same: the more expensive the car, the more sales or use tax you will pay. Where I live, the sales tax on a new car is about 9%, so a $40,000 new car would equal about $3,600 in tax. If you financed that tax with your purchase price over seven years, it would be even more. A $25,000 used car would have a tax of $1,250 (where I live), and a two-year-old car with a purchase price of $12,500 would have a tax of only $290…a savings of $3,310 over the new car example above. Another potential big cost is an extended warranty. These can add another $1,000 – $2,000 or more to the cost of the car. The debate rages on whether to buy one or not. If you’re buying a new car that gets great reviews for dependability and has a three-year factory warranty, why would you need to extend it? If you’re buying a used car, you could just put money aside each money for potential repairs instead of buying a warranty. Also, not everyone knows that you can negotiate the price of the extended warranty. I turned down purchasing one, but I was offered a seven-year platinum extended warranty for half off; that was too good to pass up. Insurance is also a cost that you'd be best not to forget. Deciding to buy a car can be overwhelming, but it doesn’t have to be. If you follow the above guidelines, you can rest assured that you’ve followed sound financial guidance on your purchase. You can break free from the chains of anxiety, doubt, and worry that came from wondering if you made a smart decision. You can feel free! Last Edited: 19th November 2017 The content of biblemoneymatters.com is for general information purposes only and does not constitute professional advice. Visitors to biblemoneymatters.com should not act upon the content or information without first seeking appropriate professional advice. In accordance with the latest FTC guidelines, we declare that we have a financial relationship with every company mentioned on this site. John, married for 27 years and the father to two daughters, blogs at Simple Financial Fitness, where he writes about keeping personal finance easy. He works full time in accounting, and as a freelance writer. Having been a car salesman for 15 years, I can tell you, the extended warranty is a sham. When a customer DOES bring a car in for repair work, trying to use that extended warranty that is SUPPOSED to cover the major items, he or she will be in for an unpleasant surprise. The Service writer(and technician), will find “numerous” items needing repair that AREN’T covered by the warranty, and ALL of them are costly to repair. Your article is very on point for the car buyer; I wish I had this understanding earlier in life. I can only THINK of how many THOUSANDS of dollars that I wasted because I WANTED a new car, when my old one ran just fine.! Thank you very much Mel for your nice comment and for sharing your insight into extended warranties. Hi Faigie – yes leasing is tempting for a lot of people, especially when they see the nice low monthly fee, without taking the time to look at the cost comparison to buying. There are cases for leasing, but for most it makes more sense to buy and buy smart. Wonderful, informative post. Thank you. As someone who’s a little wary of used cars despite knowing that it makes financial sense, I really appreciated your example in Sign #2. HI Lynn – thanks for your kind words! I am, by far, not a mechanical person so I can be leery of buying used too. Usually if you stick the makes/models that are the most reliable and from reputable dealers or owners who love their cars, you’ll be OK. Sometimes if the car is still relatively new, there can be some of the factory warranty left that can be transferred. And yes, the money saved over a lifetime is significant. “Sound mechanicals trump looks. You may not love the color or the dings in the door, but if it runs well, live with it.” Tough call John but wise words. I’m sure to remember that next time I’m in the market for a car. Thanks for the tip. I just hope the mechanically sound car isn’t bright pink! ???? Thanks Helen. I laughed when I read your comment. A bright pink car would be a tough call. On the other hand, you would get noticed. Thoughtful well- written article that explains in language a completely non-financial person (me) can understand. Makes very good points! I have tried old cars only to be left disappointed and so I opted for new cars. The money I spend on repairs was ridiculous. How do you tell an old car is good-keep in mind you can’t trust the dealers with honest information anymore? I admit it isn’t easy. Experience with a dealer is your best method, either personal or via a friend co-worker. When I buy from a person, I like to buy from someone who is meticulous and saves every receipt and seems almost reluctant to sell the car. You can also use CARFAX to get an accident history on the car. Stick with cars that have a good history of dependability, or are still fairly new (one to three years). Repairs can be tough to swallow. I had a timing belt go out that cost about $1500 to repair. At the time, I was thinking I should buy a new car, but when I realized that it was my only major repair in ten years, I was comfortable with my decision to keep it. 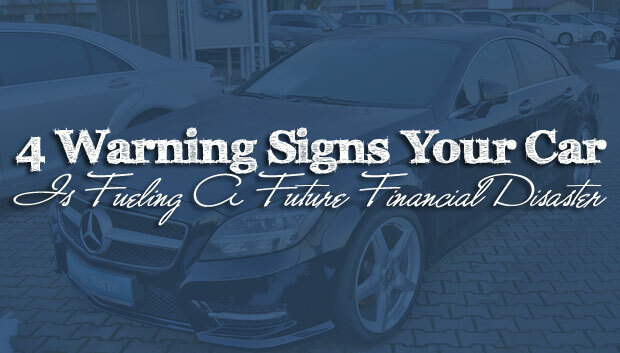 Buying a new car can be financially sound too. Go with the inexpensive models with great track records and keep them for ten years while doing all the required maintenance. Really useful post John. One tip for those buying a car – I used to sell houses, and much like in the car business, the company had quarterly and half year targets. If you go in and buy at that time of year, you are much more likely to get a discount as they are keen to make their targets! Very practical, thanks for sharing. Thank you Ellen. That is an excellent tip! When I replaced my last car, I went with a relatively cheap used car (Kia Spectra with ~75k miles on it). I liked that it was somewhat “newer”, had relatively few miles, and was a great price. I could care less about looks and brand right now; Affordability and reliability are most important to me. We think alike, DC! Thanks for stopping by and sharing your comment. At our house we prefer to buy 2-3 year old used cars that we pay cash for.. We tend to save up for years – paying ourselves a car payment – in our “next car” savings fund. When our current car starts showing signs of age and needing too many repairs, we trade it in for a used car. Doing it this way means we never have a car payment, only a paid for car. Cars seem to drive better when they’re paid for! Great strategy! The bulk of the depreciation will be in the 2-3 year range. Another tip to go along with that is to look at cars that are not the # 1 and #2 rated cars in your area. Typically these are Toyota and Honda and their values will hold much better than most cars. If you go with a car that is say #5 on the list of best buys you should get a much better deal and still get a nice car. Oh yeah, we ran into that a few years ago too when buying our most recent used vehicle. My wife went from paying $110 on her old car, to over $350 for the new SUV. It didn’t change our decision, but it was definitely a moment we weren’t expecting. Hi John. Thanks for the article. I didn’t know about the way to come up with a rough estimate for the max a person should be paying for a car. But that makes sense. My last car I purchased new that I felt because it didn’t depreciate very quickly and the savings buying used wasn’t worth the number of miles that had been placed on it. Before that I was always of the mindset to purchase used. I’m tucking this away for the future…which I hope is a ways away. Thank you. Some makes/models hold their value so well during the first couple of years (like Toyota/Honda/Acura…) that you don’t save much money buying a recent used one. If you’re in an area where SUV’s are hot, then you also have that issue. The trick is to get a model that gets great reviews but is not popular right now (like a battery-powered car when gas prices drop $2.00/gallon). Thanks so much for leaving a comment Kim! Thanks for reminding us of one of the primary financial blunders we all succumb to at some point – buying a brand new car. #1 – Good: It just so happened to be the Car of the Year and the winner of several safety awards (and the same model used by Mazda to win a few big races that year). IT has never broke down and no major repairs needed – only minor stuff like switches and hoses, etc. Translation: It’s holding a good re-sale value even with 95K miles and 10yrs old. Again, I was lucky. #2 – Not-so-Good: Had I performed my research, I wouldn’t have turned my nose up to the Mazda 3 & 6 Turbo Mazdaspeed 4-cylinder versions. I didn’t want a “4-banger”. My experience with Ford Mustangs and Dodge Challengers told me that the smaller engine versions are crap and don’t hold value. Boy was I wrong! Had I spent just 15 minutes online, I would have realized I was making a huge mistake. Turns out Mazda is the opposite of Mustang. The 4-cyl. Mazdaspeed versions are up there with the fastest and most desired factory cars on the market. And I wouldn’t even sit in them! Doh!! Translation: I passed up an even higher resale value, missed out on a factory “race-car” (I’m into that kind of thing), and a strong aftermarket for inexpensive upgrades and how-to articles. Primary Lesson: Research the resale value. Don’t hesitate to spend (or save) a couple extra grand on a car that will actually hold its value. There’s a handful of cars and trucks that will hold a lot of value even with 100K miles. 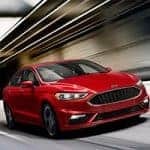 Look at Kelley Blue Book and NADA values, Google search for performance and safety reviews, read some enthusiast forums for the car you want & ask questions, and scan the used car classifieds to get a feel for how the value drops (compare last year’s new price to the current used price – how much difference is there?). A friend of mine fell into all of these traps when she purchased a brand new Dodge Dart (base-level) at a high interest rate. Less than 1 yr after purchase, she went to re-finance and was already $5000 upside-down! Why? The car has a terrible resale value and she started at a high interest rate. How much do you think she “loves” her new car now? Do your research! 15-30 minutes can save you thousands of dollars and one giant headache! Mazda may be one of the most underrated cars. My friend has had his for almost ten years and like you, hasn’t had any major issues. Thank you Blaine for sharing your insight. Hey John, great post! Your 4th point is so pertinent. I remember buying my first, very cheap, very old car, and being gobsmacked at how much I had to pay on top of the purchase price. Insurance, registration, tax … not to mention the ongoing costs of keeping it roadworthy. Thanks for the insights. Thank you Cate, yes it is funny how the “not-so-obvious” things can bite you. What a terrific article! Super sound advice! Everything you wrote makes complete sense. I’ve always been leery of used cars but now I see that you’re better off in the long run as long as you’re careful. Aside from being a very informative article, it’s also very well written. So clear and easy to understand. Normally, I don’t like reading financial advice because it’s so dry and boring. But yours is totally different. Thanks so much for this writing this! Thank you Cherryl, what a wonderful comment! Great and thoughtful article John. I still wince when I think of the first car that I bought in this country. Brand new and shiny and I thought I was the bees knees until I discovered that just driving it off the lot I’d lost about five grand! Never to be repeated experience. And this post helps all of us consider angles that might not have been thought of. Thank you Elle. I appreciate it very much! Thanks for this post, John. I find these big decisions so intimidating that I usually end up outsourcing them to someone I trust. Your suggestions give me hope that I could make a good choice myself! Thanks Nicki. There are also services that will inspect a car for less than $100 and Carfax offers a nice history of a car for not too much money. These can be worth it when you are spending thousands for a car. Can someone tell me why people rush into buying cars without think? Sometimes you think that you’re doing yourself a favor by going for the low monthly installments but in the long run you end up losing. Great article. Just about bought a new car but will look at used market. You need a car in Florida, so gotta get something to drive. Previous Post: What Does It Take To Be An Entrepreneur?